As someone who has been getting 30mil disadvantages nonstop our TW post fix was surprisingly way more equal. We had a 10mil disadvantage but both guilds only had 1 Revan and we got through their's and they couldnt get through ours. Hopefully the GP disadvantage doesn't extend past 10mil in the future but not facing 6 territories of 80-110k+ teams was pleasant. Still, the amount of other people who are still getting mismatched is troubling. It means we probably just got lucky. @CG_SBCrumb Realizing we all have our opinions, pro and con. Is "Get Good" the official stance on this? Our internal discussion (guild) is trying to determine our next step. A long time back when players complained about the Galactic war difficulty CG J. Salero said "It's supposed to be hard!" So... with that in mind, what is the official stance? Many see the changes as a mistake since things for many became more difficult. In point of fact they may be working exactly as planned. Which is it? To quote The Clash "should I stay or should I go? ", is on many minds. We already lost a member over night. What can we look forward to? @DuneSeaFarmer I'd tell your guild that a single TW is not enough time to judge the effectiveness of the new algorithm. From what I can see, the new algorithm is pretty much matching active GP very closely (although not always the average player GP, which I think is more impactful). The bots that do guild comparisons can never see how many players signed up for an individual war, and so oftentimes guilds get "tricked" into thinking they are facing a much higher GP than actually signed up. Sadly many feel like they have been let down and, well flat out lied to, they are running short on patience. Maybe it's time that guild matchmaking no longer relies on how many sign up? It's a "guild" event. Match up, then set territory defense. 24 hours later start the offensive campaign. And it's not a punishment if your guild members don't have time to participate, but they're "included" as matchmaking power. Other guild events don't take into account how many post damage. Funny how all those 50/50 "daily 600 token" guilds only have 38 people sign up for TW. It's a strategy, and it's pays off more often than not. My guild was 50/50, and beat a higher overall GP guild last war. I guess the 8 people who sat out wasn't quite enough to create a mismatch so they could roll over their opponents. Maybe next time they'll sit out 12? Then again has it ever crossed your mind that those 8 missing had other things to do in real life or even worse just plainly dont like TW so dont sign up for it? Yes, I did. It's a guild event. Put guild against guild. Any algorithm that benefits non-participation, to the detriment of participation is poorly conceived. Has it ever crossed your mind that guilds that have full participating members don't like being at a disadvantage for signing up? Strangely enough it is a game..... so people should be forced to play a part of the game they dont like just to make other guilds happy, nah dont see it happening, a game you play when you have time and a space inbetween real life events that actually matter. there is more than enough that "needs" to be done in this game than force people to play an event they dont have time for or just dont like. So what happens if each member puts in 1 team and just waits it out? Will they be sanctioned by CG? Well, if it's a game then nothing "needs" to be done. It's what people have time for. If all 50 in my guild have time, so be it. 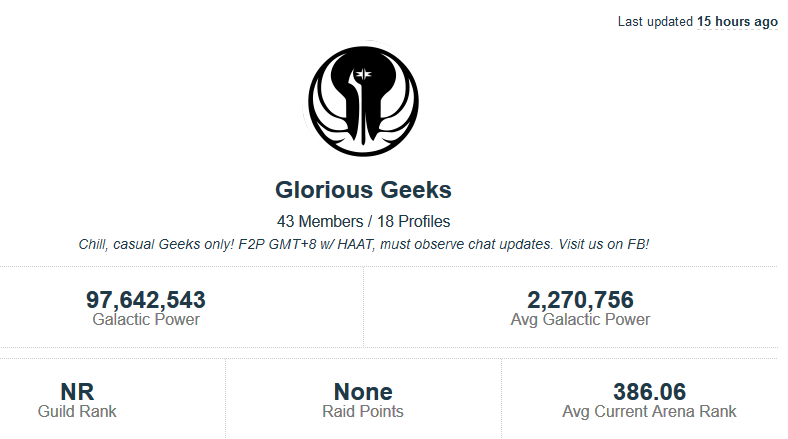 If a similar guild gets matched to us, and only 42 people have time for it, I'd consider it WAI. I was just pointing out the fact that in a guild event, having less than a full guild tends to give an advantage over a guild that has the 50/50 signup. Eliminate the sign up, and just go at it. If CG changed the matchmaking to omit "active" GP it would most likely match guilds more closely. Something that seems to be a concept that a few posters seem to be against. When I joined my guild, and we were rewarded with the hardest TW to date ( a bunch of Trayas vs our 0). I posted on our guild Discord, I'd rather take 2nd place that have people sit out to gain a favorable matchup, and everyone agreed, I knew I was in the right guild. 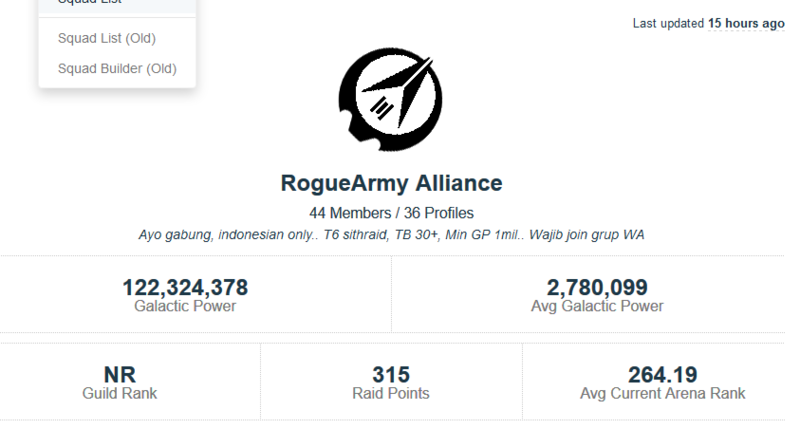 Our guild (https://swgoh.gg/g/12985/prepaired/ for context) have always been a TB guild. We always punch above our weight in terms of star count and always have. We use Discord to ensure maximum participation and rewards. TW was always a distraction, an unwanted game mode that took away from our precious TB bashing. But, as time wore on, the whole TB thing became automatic. We're on 44* LS and 47* DS at the moment, and nothing other than waiting for the GP to grow enough to hit max stars will help us improve that. We've had Sith raid on farm for 7 months as well. We figured we may as well care about TW, since everything else was looking after itself. 1) We always tried. Even when we could tell we were going to get pounded, we aimed to achieve something, even if it was clearing 1 traya zone or similar. 2) Because we'd always tried, when we finally got match ups that were fair or even in our favour, guild members were better placed to convert these matches to a win. If you set defences and wait it out, will you be able to beat a guild that you are fairly matched with who are much better practised than you? 3) Despite what people think, going into TW with a few members missing does not guarantee an unfair match up in your favour. During a transitional phase we had 47 or 48 for 3 successive TWs and we did NOT get a huge GP advantage! Then, one time we went in with 50 and we got essentially a walkover where enemy couldn't clear either front zone. 4) (Linked to 2...) strategy is as important as GP / Traya / Revan count. We're on 5 wins in a row just now, 4 of them have been comfortable against guilds very similar to ours and 1 was very tight against a guild with 10M more GP than ours. Their strategy in terms of team placement was poor, which is why we beat them. If you don't try, what are you going to do when you finally get a fair match up? The problem with matchmaking against the whole guild (even the members who didn't sign up) is that it will punish the guild who had players that either were busy, don't like TW, or have terrible rosters (like a ticket alt). It's more fair to let players sign up and then only match against the active GP. I think it's then even more fair that "average player GP" needs to be close also though - 33 3M players will steamroll 50 2M players. Every guild that fields fewer than 50 players isn't necessarily doing it skew the battlefield and increase their chances of a better matchup. Some players are too busy to take part in a TW, some may just hate that game mode. It's true that some guilds were doing that, but it's not fair to assume every guild is trying to game the system for an unfair advantage. We all depend on the algorithm to give us fair matching. My guild's last two matchups have been very very close, and we literally won both within the last few minutes of the war - both of which were VERY exciting! My guild intentionally dropped the gp in past tw matches as it always benefitted us. In contrast, when we had full signups before the algorithm change, we always ended up matched against guilds which were 30m gp higher with twice as many key meta toons. In the most recent tw we were below 50/50, but that was purely due to players who were busy. In the end, we were fairly equally matched based on the latest algorithm and we are pleased. I would like know the fun in farming a toon to gear him up and the rest of team to have it just banned from use in the game . The devs are just pushing the game into the ground . Months years of building teams and farming gear are sitting in my inventory unable to be used. Waste time f time this game is. This is the matchmaking we found for the TW starting now. This is by far the most unbalanced matchmaking we've ever found. We're used to fight against higher PG guilds but this is simply nonsense. Whats your sign up number and defensive slot number? That may matter, but I agree that on the face of it that appears ridiculous. Interestingly if you search up your enemy guild you can find a post on here from October when they had a similarly ridiculous match up. It appears the game is generating repeatedly easy match ups for them. Date of TW: 28-01-19 "TW 59-A"
Joined members: 50 vs 45/46 (23 slots per territory). I was asking myself: Did they ever say that the matchmaking is designed to give guilds equal/comparable chances to win? As far as I remember all they said was that they match guilds. But not that the match is intended to be fair. ...I dunno. Is anyone actually reading all this? @Ryche @Mhmacleod same question as always. How many of your guild signed up and how many teams per zone did you need to fill? My guess is the enemy didn’t all sign up and you were sand bagged. Empire strikes back 170 mill GP guild. We have to place 21 teams. Getting match ups like this completely ruins the game mode should match guilds on thei average GP for everyone locked in. As long as a guild can manipulate their matchup, there will be problems. I do not know the answer but 40 members from a 220mil gp guild has a huge advantage over 50 members of a 180mil go guild, an unsurmountable advantage. I do not think guilds should ever be matched up outside of a 5mil gp difference, no matter how many signed up. It shouldn't be based on GP alone, surely. 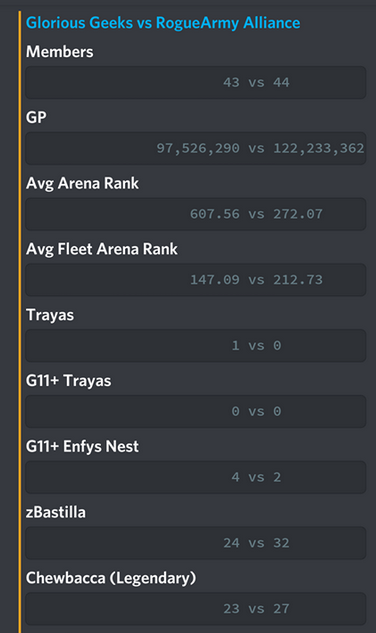 We have 5 Trayas and only a few Revans for this TW and have been matched with a team that has a similar GP but 42 Trayas. 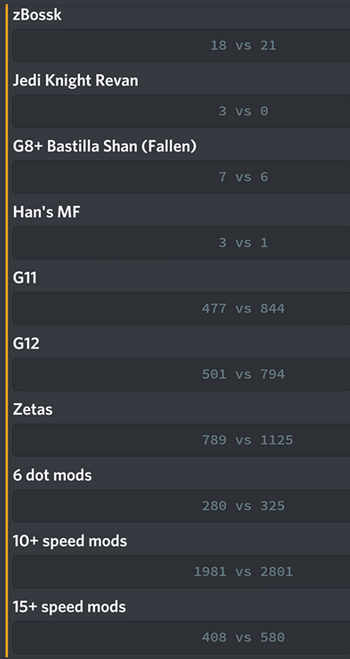 Their mod and G12 stats obliterate ours so we never stood a chance.Mismatches aren't just boring if you are on the receiving end of one but also drive people away from the game mode. Please sort it out CG. Braveheartz have been mentioned before in this thread as a team with a significantly higher gp than their opponent. Coincidence? maybe but probably not. Opponent guild is much higher then ours. We have been thrown into the same "basket" because there are fewer of them. They should fight the ~ 190M guild, where fewer people have been registered. TW should be a guild duel on a similar level, not a broken toy. Date of TW: 24/2/19 "War 63-A"